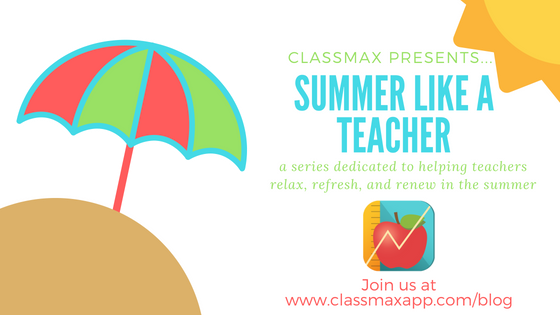 This week, ClassMax will be sharing a series called, “Summer Like a Teacher,” where we cover the three key parts of a teacher’s summer: Relaxing, Refreshing, and Renewing. Today, we continue with the step that separates the good teachers from the really great teachers: Renew. Once you are relaxed after another long school year and have taken time to refresh yourself with reminders of why you love teaching, then comes the hard work of renewal. We all know that the teaching profession can be one of the most physically, mentally, and emotionally taxing careers out there. We put our heart, mind, and body into our work and that can yield wonderful consequences… but it can also burn teachers out. We have all heard the statistics about teachers who don’t return after their first, third, or fifth year teaching. But more than statistics, we’ve all probably experienced that burn out for ourselves. While we chose to stick it out, it is easy to understand those who decided this profession was too demanding to be worth it. Burn out is no joke, and it’s also not something that a lazy summer is going to fix. 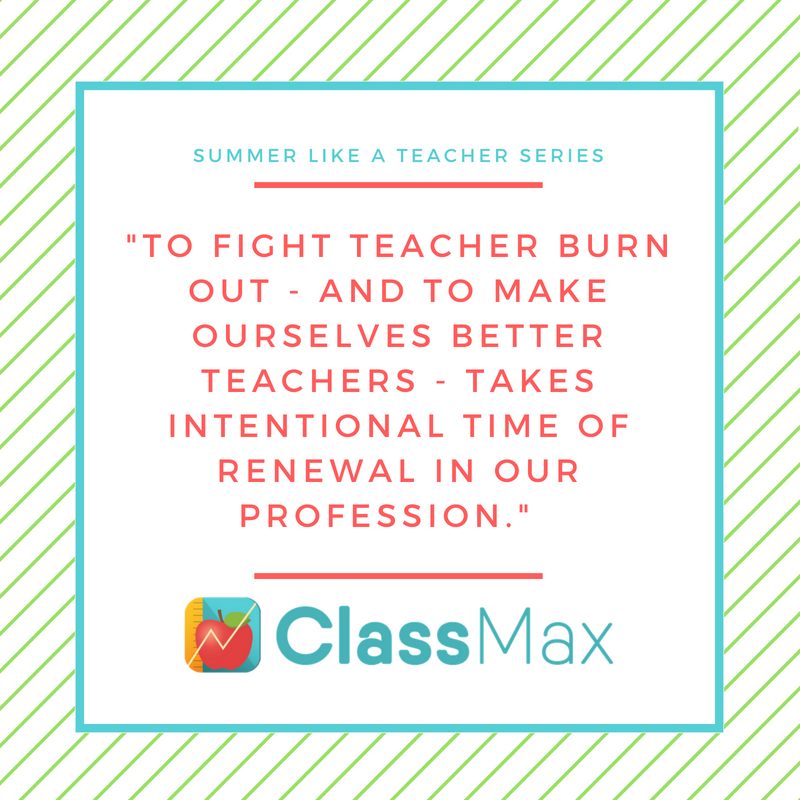 To fight teacher burn out – and to make ourselves better teachers – takes intentional time of renewal in our profession. It takes time to hone our craft, to make changes to our teaching, and to refine ourselves as professionals. And that is why we need a period of renewal during the summer. Like our students, we should be constant learners. My mentor teacher throughout the beginning of my teaching career was a seasoned teacher who was twenty years into her career. She taught me so much about lesson planning, unit cohesion, classroom management, and rigorous instruction. But the one that I that I learned the most from her was that no matter how long you have been teaching, keep trying new things. She was the first to sit down with a list of instructions for some new website or program and teach herself how to use it. She watched tutorial videos when she didn’t understand, she contacted the help center when she had questions, and she NEVER GAVE UP. No matter what new shiny tool came across her desk, Tammy continued to give everything a try. It is this passion for always being open to learn new things about teaching that I took away the most from her and it’s one of the best lessons we can all learn as we renew ourselves for another year. There’s always some new crazy fad in teaching, isn’t there? From the ol’ faithful close reading and think-pair-share, to the flashier Socratic seminars and escape room challenges, teaching strategies continue to evolve as quickly as our students. But so often, teachers get stuck in their favorite tried-and-true methods of teaching, not because they are opposed to trying something new, but because WHO HAS TIME to try something new? Well, teacher friends… summer is that time. Write a few lesson plans that include some new teaching strategies. Maybe there were some things you found during your refreshing stage of your summer that peaked our interest? Go ahead and plan out a lesson or two… or even an whole unit! If you stick with your same content-based scope and sequence every year, then plan a generic lesson that you can use for any standard or skill you are teaching. At some point in the year when you and your students are feeling the fatigue that comes with the same routine every day (usually around January, for me), pull out that awesome lesson your planned over the summer, drop your content into it, and see what happens! This one is the hardest step for me and one I often like to do with a teaching friend. My former PLC and I used to do this over the summer and it was always so helpful. We went through our previous teaching year unit by unit and we gave a thumbs up or thumbs down to just about every lesson or activity that we taught. We based our assessments on how effective we felt our students learned the material AND on how engaged the students were during instruction. If an activity lacked in either of these two areas, we dropped it. This left us with a solid foundation of activities that were tested and fine-tuned over the years and it gave us holes in our instruction that we could fill with new, stronger, more dynamic, engaging lessons. The result was that every year, our content improved. Every year, our teaching improved. This is such a critical part of teaching, but it is one that teachers seldom have time or energy for once the school year has begun. Summer is a perfect time to sit down with a friend and your lesson plans and begin that critical process of assessing your instructional practices. We all look forward to summer break. It is a much needed break from a profession that has a high burn out rate. But with a few intentional steps, you can use that time away from the classroom to make yourself a better teacher. RELAX – Give yourself permission to relax into the summer. You’ve already put away your classroom for the summer physically, now mentally put it away. REFRESH – Once you have truly relaxed for a while this summer, start to slowly refresh your teaching career. Take time to research other teachers, to explore new ideas, and even treat yourself to a few things you don’t normally get during the school year. 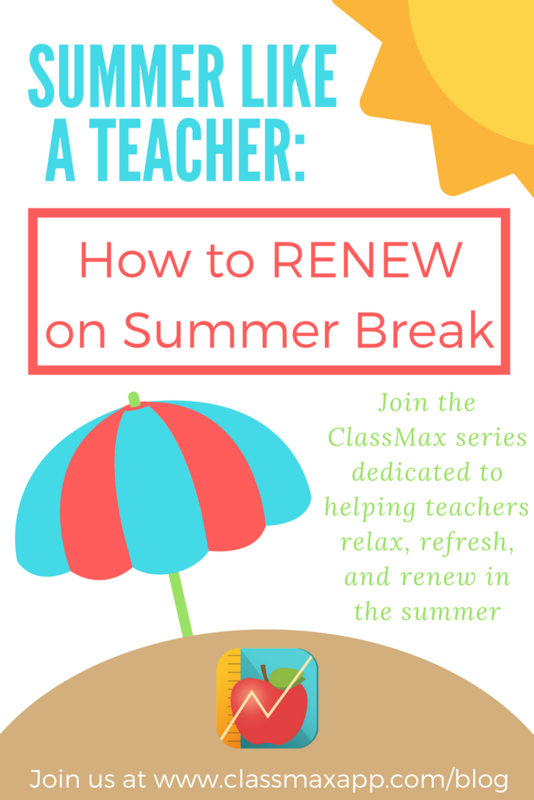 RENEW – The final piece that truly makes a difference in summer break is to renew your commitment to instruction. Keep learning about ways to improve your teaching, be open to new ideas in your classroom, and take time to assess your instructional practice. With these three steps, you will be amazed at how ready you are when the school year begins again. You will feel rested, excited, and confident in your abilities as a teacher. And that, teacher friends, is how you set your students up for success. This entry was posted in Summer Like a Teacher Series, Teacher Life and tagged Summer Like a Teacher.